On 1 May 1861, the first train operated between Exeter and Exmouth, transforming the lives of those living along the route. 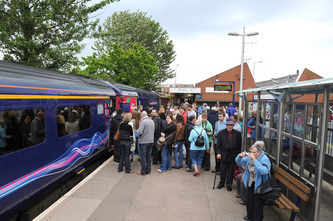 Today, operated as part of First Great Western's 'Avocet Line', the local passenger user group The Avocet line Rail Users Group coordinated a day of celebrations on 1 May 2011 to mark the anniversary. 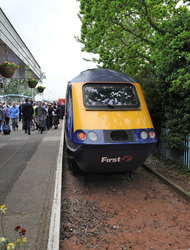 The highlight was the running of a FGW full length HST between Newton Abbot and Exmouth. Major events were held at all stations on the East Devon branch which attracted a huge number of visitors. The HST set formed with power cars 43149 and 43091 with passenger set LA02, operated as train 2Z30, 09.50 Newton Abbot to Exmouth calling at all stations, and returned as 2Z31, 11.33 Exmouth to Newton Abbot, again stopping at all stations. Between Exeter and Exmouth the train was full in both directions. Many passengers dressed in period costume.